Bob and Kathi are full-time musicians always involved in several musical projects. They have years of experience between them in many styles of music and access to a talented pool of other musicians. They are tasteful and professional whether playing a small venue or large concert – able to adapt their sound, performance and repertoire to fit any occasion or situation. For Bob’s original music, check out the Original Music and Mick Ryan’s Lament pages. 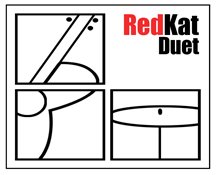 RedKat Duet (Bob Dunlap and Kathi Taylor) combines guitars, percussion and vocal harmonies to create a big sound in a small package. Their love of great songs and appreciation for different genres – rock, folk, blues, country – influences their classic selection of material from Armstrong to Zevon, Dylan to Joni, Hank to Dolly, Elvis to The Beatles, The Band and beyond. Depending on the venue, the duo uses a small percussion set up or more drums. Here’s Bob and Kathi performing “I’m Looking Through You” (Beatles) at Sandwich Community TV (acoustic guitar and small percussion set up). Bob•Kat (Duo – Bob Dunlap and Kathi Taylor) performs with a more acoustic, traditional sound, adding the bodhran (Irish hand drum) along with Kathi’s snare work, and featuring the acoustic guitar. Lots of experience with, and a love for Irish music and “roots” or “Americana” – folk, cajun, blues, country, rock and rockabilly makes this duo a hit at Irish pubs and private parties. Here’s Bob and Kathi performing City of Chicago by Luka Bloom. Recorded at Sandwich Community TV (acoustic guitar and small percussion set up). Bob•Kat Trad Trio adds a traditional guest artist for a real Celtic flavor, including renowned musicians such as Rose Clancy (fiddle), Stuart Peak (mandolin, banjo, whistles), and Nikki Engstrom (fiddle). 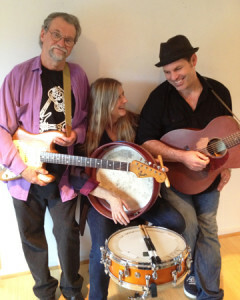 The trio performs lively traditional tunes, Irish jigs and reels, beautiful instrumentals, and favorite Irish songs. A popular group at Irish pubs, wedding ceremonies and receptions, and other events – from small house parties to large functions. 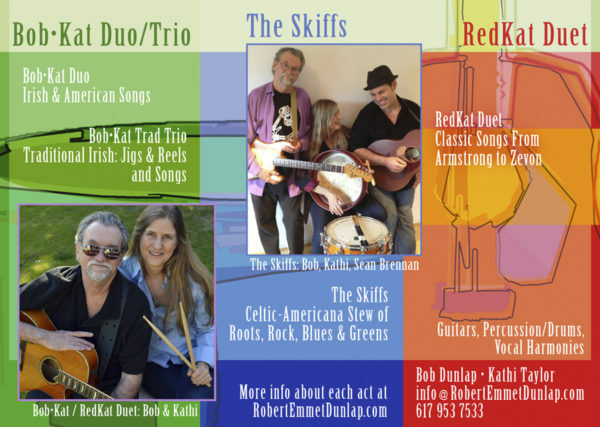 The Skiffs are a high energy trio with Sean Brennan (acoustic guitar and vocals), Bob Dunlap (acoustic and electric guitars, and vocals) and Kathi Taylor (drums, percussion, and vocals) that play a “Celtic Americana Stew of Roots, Rock, Blues and Greens”. Serendipity brought them together and a spark ignited when they combined their talents. The band’s creative interpretation of original and classic songs, driving rhythms, outstanding solos, infectious beats and three-part harmonies, combine to create a big sound and soulful performance, whether delivering a sensitive ballad or rocking the house. 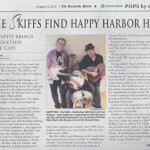 The Skiffs were winners of the 2013 Cape Cod Arts Foundation Spring Talent Search earning them an opening slot for the Boston Pops concert in Hyannis that summer. 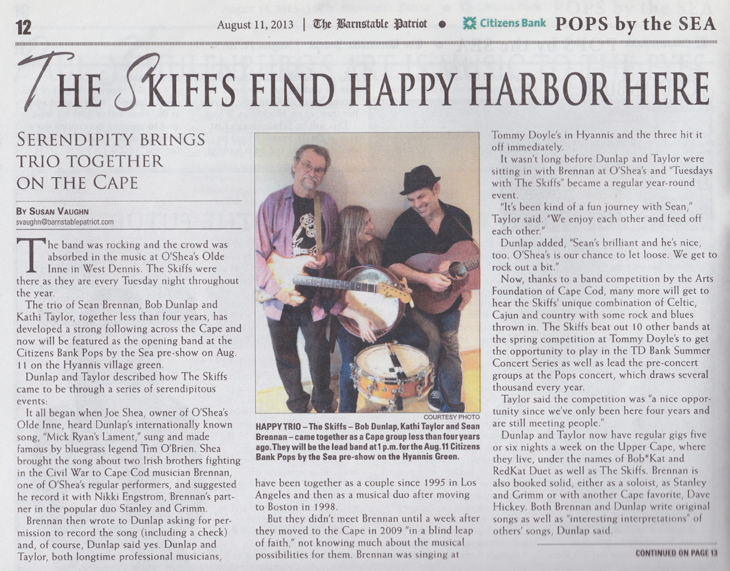 Visit The Skiffs on Facebook. Hogan’s Goat (Bob Dunlap – guitar, vocals; Kathi Taylor – snare, bodhran, vocals; Skip Toomey – accordion, whistle, banjo) is a trio originating from South Boston that plays a high energy mix of songs and tunes that would have been heard in that most Irish of Irish-American neighborhoods over the last century or so – from traditional reels, jigs, polkas, and marches, to “Boston Irish” and tin pan alley songs of the 20s, to contemporary Irish ballads. They have been performing together for the past 15 plus years, playing intimate living room celebrations to large performances (with additional musicians) at places like the Boston State House. The band combines ancient melodies, tight harmonies, and modern rhythms in a way that celebrates the history of two unique but inter-connected places over a long period of time; a time in which music flowed not only through the lives of the people, but back and forth across the Atlantic. 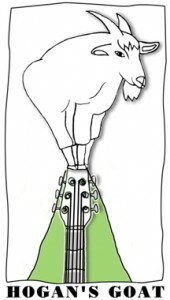 Accapella sea shanties, acoustic tunes with traditional instruments, original arrangements with a driving rhythm section along with three part harmonies – it’s all delivered by Hogan’s Goat. Sign up to receive news about upcoming shows. We don't share your email address with anyone.